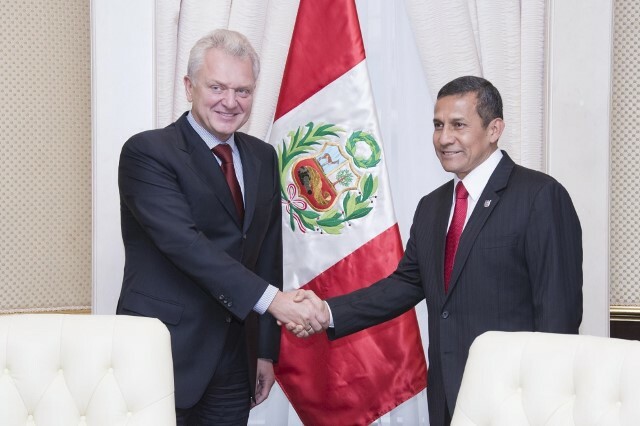 November 7 in Moscow, Viktor Khristenko, Chairman of the Board of the EEC, had a meeting with a delegation from the Republic of Peru headed by the country's President Ollanta Humala The meeting participants discussed possibilities for trade and economic cooperation and pointed out the high level of mutual interest in the development of cooperation. Minister in charge of the Development of Integration and Macroeconomics Tatiana Valovaya also participated in the negotiations. The Republic of Peru was represented by the Foreign Minister of Peru Gonzalo Gutierrez, Minister of Foreign Trade and Tourism of Peru Magali Silva Velarde-Alvarez, Ambassador Extraordinary and Plenipotentiary of the Republic of Peru to the Russian Federation Juan Humberto Umeres Álvarez. Viktor Khristenko described in detail the integration processes in the Eurasian space, the goals and tasks of the Eurasian Economic Union (EEU). He also emphasized the importance of interaction between the integration associations—the Eurasian Economic Union and the Pacific Alliance, whose member Peru is. Based on the results of the meeting, it was decided to start preparing of a Memorandum of Cooperation between the EEC and the Government of the Republic of Peru to organize a system dialogue on the issues the parties are interested in. During the meeting, the intent of Peru to receive a status of a EEU observer was also discussed.